This name uses Spanish naming customs; the first or paternal family name is García and the second or maternal family name is Lorca. Federico del Sagrado Corazón de Jesús García Lorca; (5 June 1898 – 19 August 1936) was a Spanish poet, dramatist and theatre director. 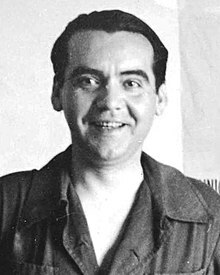 García Lorca achieved international recognition as an emblematic member of the Generation of '27. He is believed to be one of thousands who were summarily shot by anti-communist death squads during the Spanish Civil War. He was gay. In 2008, a Spanish judge opened an investigation into Lorca's death. The Garcia Lorca family eventually dropped objections to the excavation of a potential gravesite near Alfacar. However, no human remains were found. ↑ "Routledge Modern and Contemporary Dramatists". ↑ Estefania, Rafael (2006-08-18). "Poet's death still troubles Spain". BBC. Retrieved 2008-10-14. ↑ "Lorca family to allow exhumation". BBC. 2008-09-18. Retrieved 2009-05-28. Gibson, Ian (1989). Federico García Lorca. London: Faber & Faber. ISBN 0571142249. OCLC 21600658. Stainton, Leslie (1999). Lorca: A Dream of Life. London: Farrar Straus & Giroux. ISBN 0374190976. OCLC 246338520. Wikimedia Commons has media related to Federico García Lorca. This page was last changed on 10 February 2019, at 22:14.